Combustion technology has traditionally been dominated by air/fuel combustion. However, two developments have increased the significance of oxygen-enhanced combustion—new technologies that produce oxygen less expensively and the increased importance of environmental regulations. Advantages of oxygen-enhanced combustion include less pollutant emissions as well as increased energy efficiency and productivity. Oxygen-Enhanced Combustion, Second Edition compiles information about using oxygen to enhance industrial heating and melting processes. 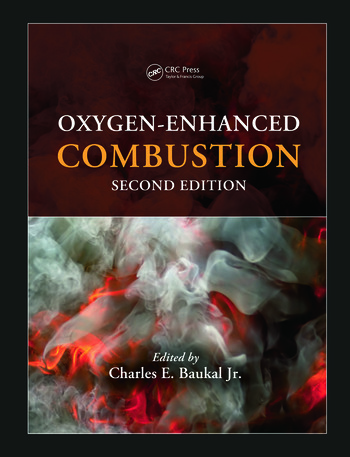 It integrates fundamental principles, applications, and equipment design in one volume, making it a unique resource for specialists implementing the use of oxygen in combustion systems. This second edition of the bestselling book has more than doubled in size. Extensively updated and expanded, it covers significant advances in the technology that have occurred since the publication of the first edition. This book offers a unified, up-to-date look at important commercialized uses of oxygen-enhanced combustion in a wide range of industries. It brings together the latest knowledge to assist those researching, engineering, and implementing combustion in power plants, engines, and other applications. Introduction, Charles E. Baukal, Jr. Fundamentals, Charles E. Baukal, Jr.
Fluid Flow, Wes Bussman and Charles E. Baukal, Jr.
Heat Transfer, Charles E. Baukal, Jr.
Flame Impingement, Charles E. Baukal, Jr.
Pollution Emissions, Charles E. Baukal, Jr.
Burner Design, Hisashi Kobayashi, Rémi Tsiava, and Charles E. Baukal, Jr.
Glass, Prince B. Eleazer III and Bryan C. Hoke, Jr. Thermal Oxidation, Charles E. Baukal, Jr.
Charles E. Baukal, Jr., Ph.D., PE, BCEE, QEP, is the director of the John Zink Institute for the John Zink Company, LLC (Tulsa, Oklahoma), where he has been since 1998. He previously worked for 13 years at Air Products and Chemicals, Inc. (Allentown, Pennsylvania) in the areas of oxygen-enhanced combustion and rapid gas quenching in the ferrous and nonferrous metals, minerals, and waste incineration industries. He has more than 30 years of experience in the fields of industrial combustion, pollution control, and heat transfer and has authored more than 150 publications in those areas. Dr. Baukal has served as an adjunct instructor for Oral Roberts University, the University of Oklahoma, the University of Tulsa, and the University of Utah. He is the author or editor of thirteen books in the field of industrial combustion. "… contains a wealth of technical information … Each of the chapters is well written and edited and … contains much information that is not readily available …"